The Devil's Feast ("Şeytan Sofrası" in Turkish) is a hilltop located 8 kilometers from the district of Ayvalık in Balıkesir province, a tourism hot spot for locals as well as foreigners in one of the most important tourism centers of the Aegean Region. If you want to enjoy a bird's-eye view of the Ayvalık islands and the Greek island of Lesbos then travel here and experience one of Turkey's most legendary places in tourism. According to legend this hilltop has the footprint of the devil, a mystery that attracts tens of thousands of tourists during the summer months. 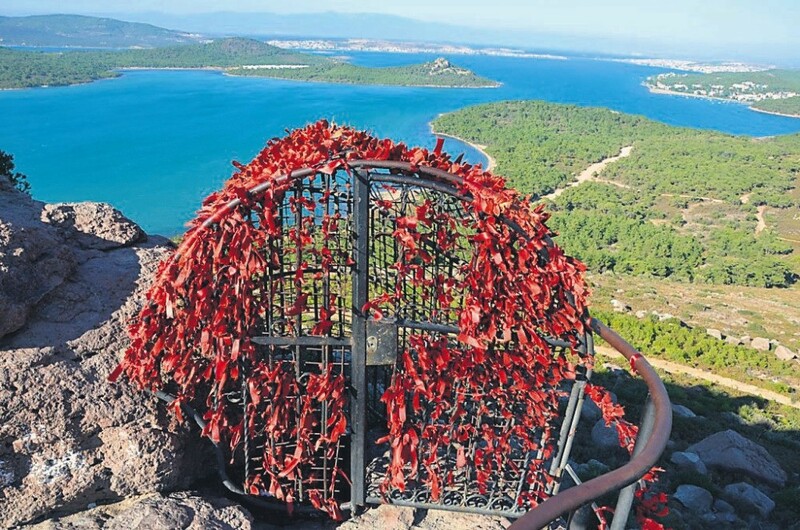 As one of the most widely known landmarks in Ayvalık, Devil's Feast comes to the fore as the number one observatory point, boasting the most beautiful panoramic view of the Ayvalık Islands Natural Park which is the largest natural park in Turkey situated on roughly 17,950 hectares of land. The legendary footprint lies under the cage where tourists put red ribbon to make a wish. 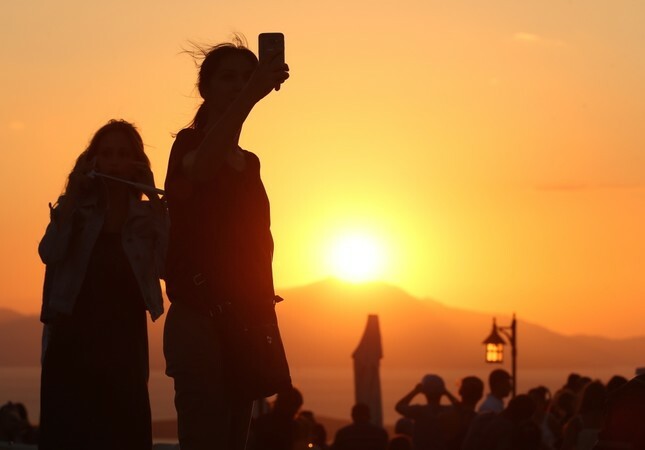 After making a wish in an area decorated in red ribbon, tourists can enjoy a stunning view of the sunset alongside the numerous professional photographers who also frequent the hilltop. Those who visit the Devil's Feast enjoy the insatiable pleasure of seeing the sea, bays, islands and forests from a hill overlooking the landscape. Tourists here are captivated by the beauty of the sunset and often recommend this place to others after experiencing the beauty for themselves. The Devil's Feast, which is connected with Küçükköy Municipality also includes the Sarımsaklı Beaches which are famous for beautiful sandy beaches and crystal waters as well as a municipality-owned restaurant. Fırat Kılıç, a local business owner in the region, said that the restaurant offers a place for tourists to cool down after enduring the sweltering heat during summer, suggesting that tourists take advantage of transportation provided by minibuses that leave from the Ayvalık Bus Station as well as private vehicles. Situated on a hilltop that was created by a lava pond left behind by a dormant volcano, Devil's Feast has a round table or iron-caged shape that resembles a giant footprint. According to rumor, a girl named Penelope (also nicknamed the Devil) isolated herself from people and lived a mystical life on this hilltop during the Ottoman Empire's rule. When famine hit Ayvalık which was mostly occupied by the Greeks, the clergymen and pastors pointed to Penelepe as the one causing the famine and provoked the residents to lynch her. Getting the news from a goat shepherd, Penelepe had no choice but prepare a perfect feast. People who came to lynch Penelepe were drawn to the table like a moth to a flame and forgot about Penelepe who, by the way, escaped the place immediately. From that day forward, this hilltop has been called the Devil's Feast. According to the legend of the footprint on the hilltop, Mount Ida ("Kazdağları" in Turkish), which overlooks the Gulf of Edremit, is the mountain where the Greek myths took place. Both monotheistic and pagan religions have one common characteristic: They all suggest that the devil was cast out of heaven here. In the Greek mythology, this task was assigned to the Moon Goddess Selene by the king of gods, Zeus. The devil, cast out of heaven by Selene, is rumored to have escaped by putting one foot on the Devil's Feast and the other on the Greek island of Lesbos. How to get to Devil's Feast The Devil's Feast is located above the Çamlık Forest Camp. Visitors can see the hill's sign from Sarımsaklı coming from İzmir. After a 2-kilometer climb on a path surrounded by trees, you can embrace a view of the Ayvalık islands.